Acknowledged author Margaret Jordan Halter PhD PMHCNS wrote Varcarolis' Foundations of Psychiatric Mental Health Nursing: A Clinical Approach, 8e comprising 696 pages back in 2017. Textbook and etextbook are published under ISBN 0323389678 and 9780323389679. Since then Varcarolis' Foundations of Psychiatric Mental Health Nursing: A Clinical Approach, 8e textbook received total rating of 4.5 stars and was available to sell back to BooksRun online for the top buyback price of $27.22 or rent at the marketplace. 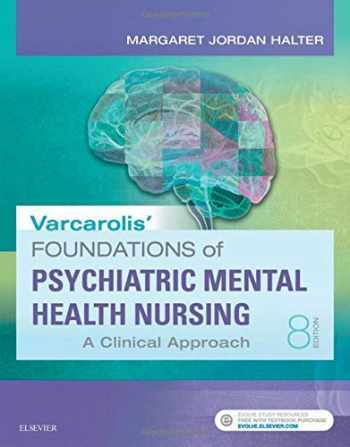 Varcarolis' Foundations of Psychiatric-Mental Health Nursing, 8th Edition is the most comprehensive RN psychiatric nursing text on the market! Awarded second place in the 2018 AJN Book of the Year Awards in Psychiatric Mental Health Nursing category. User-friendly by design, it simplifies the often-intimidating subject of psychiatric-mental health nursing with a practical, clinical perspective. This edition was revised in conjunction with a readability expert to support clarity and ease of understanding. Chapters follow the nursing process framework and progress from theory to application, preparing your students for clinical practice with real-world examples. New to this edition are full-page illustrated explanations about the neurobiology of disorders and associated medications, criteria from the American Psychiatric Association's Diagnostic and Statistical Manual of Mental Disorders, 5th edition (DSM-5) for major disorders, completely revised Evidence-Based Practice boxes, and a fully rewritten chapter on Dying, Death, and Grieving to provide students with essential information about difficult topics.Mentor-like writing style reinforces important information and helps in applying textbook content to the clinical setting.Coverage of key topics and emerging nursing trends keep you current with best practices in the field.Considering Culture boxes discuss the importance of person-centered care in providing competent care to diverse populations in various clinical situations.Vignettes with vivid mini-stories prepare you for real-world practice with personal, descriptive characterizations of patients with specific psychiatric disorders.Health Policy Boxes introduce the role you can play in advocating for patients and the profession.Clinical chapters follow the six-step nursing process, providing consistent guidelines for comprehensive assessment and intervention.NEW! Full-page illustrated explanations about the neurobiology of disorders and associated medications. NEW! DSM-5 guidelines from the American Psychiatric Association's Diagnostic and Statistical Manual of Mental Disorders are fully incorporated in the text, and include updated NANDA content.NEW! Completely revised Evidence-Based Practice boxes. NEW! Revised chapter on Dying, Death and Grieving gives you all the vital information you need.NEW! Ten NCLEX-style questions and answers at the end of each chapter.